BANGI, 20 Oct 2012 – Local universities have to set high benchmark for their students to enable them to compete with graduates from foreign universities. 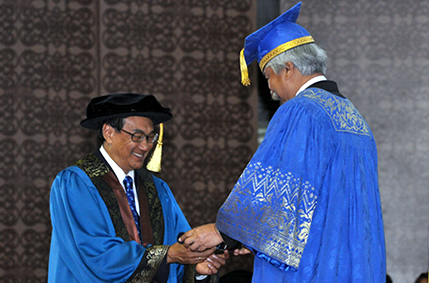 Speaking when receiving an Honorary Doctorate in Law award from The National University of Malaysia (UKM) Chancellor Tuanku Muhriz Ibni Almarhum Tuanku Munawir at its 40th Convocation today, former Chief Justice Tun Zaki Tun Azmi said the local graduates’ ability to compete will place Malaysia on equal footing with other countries. The said the value of a graduate is not his degree certificate but his ability to use knowledge and skills to compete in the real world. Tun Azmi who has contributed immensely to the betterment of the Malaysian Judiciary said globalization is not something that is in the distant future but has already arrived. A few of foreign universities have opened their branches in Malaysia and graduates from local universities have to compete with their graduates for employment, he said. And in the legal system from next year foreign lawyers can practice in Malaysia. “I am not saying that local graduates lack the ability to compete, but our graduates still rely on memorising, compared to graduates from foreign institutions that use their thinking abilities more,” he said. He viewed the honour given to him for the award is not because of his efforts alone but the achievement of the whole judicial system. The prestigious award, he said is a recognition of the contribution of those in the Judiciary alluding to efforts in tackling delays in seeking justice. As a result people now need not have to wait for years to get justice, he said. He is one of the seven recipients of Honorary Doctorates from UKM in recognition of their invaluable contributions to the country.